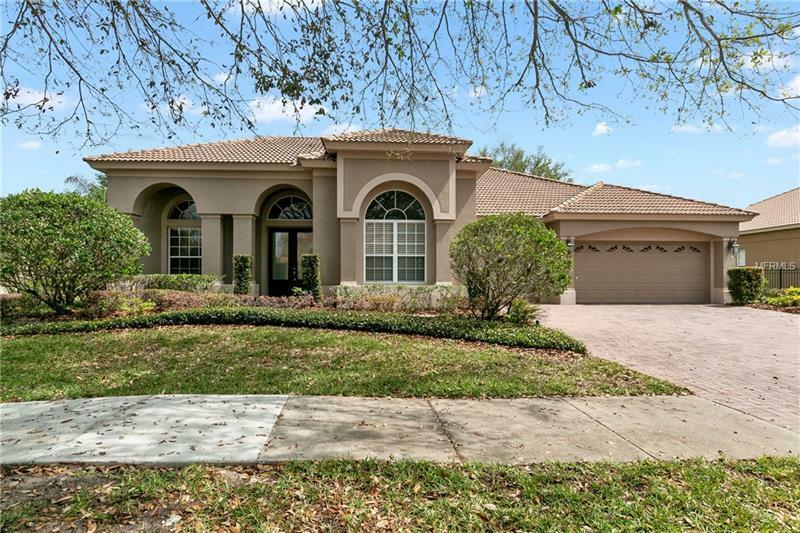 Great floor plan in beautiful gated Palma Vista! 4th bedroom is actually a den. Freshly painted inside and out! Split bedroom plan â one secondary bedroom has an en-suite bath! Massive master bedroom and bathroom. Twin sinks and vanities, make-up vanity, soaking tub, and huge step-in shower make the master bathroom a body and soul retreat! Gorgeous wood floors in all bedrooms, living room, and office. Desirable open floor plan is perfect for entertaining! Gourmet kitchen features an island and an abundance of counter tops, cabinets, and a step-in pantry. Breakfast bar backs to the spacious breakfast nook and family room â all with beautiful views of the outdoors. Generously sized family room is complete with wood burning fireplace and sliders to the lanai and sparkling pool. Bring the outdoors in while mingling with your guests on the screened lanai. Over-sized three car garage has room for everything! Convenient location with easy access to downtown Orlando and area attractions.